An iconic American author and screenwriter of fantasy, horror, and science fiction, George R.R. Martin is best known for his epic fantasy series A Song of Ice and Fire. As a child growing up in New Jersey, George R.R. Martin displayed an early interest in "the writing life" by selling monster stories of his own invention to the children in his Bayonne neighborhood. In high school he became an avid comic book collector and began to write for comic fanzines. He sold his first story to Galaxy in 1970 when he was 21 years old. Martin received his bachelor's and master's degrees in journalism from Northwestern University. After graduation he served two years in VISTA, then worked as a teacher and chess tournament director in the Midwest, while continuing to craft award-winning short fiction. His first full-length novel, Dying of the Light, was published in 1977. A dark, lyrical sci-fi tone poem set on a doomed world without a sun, the book was nominated for a Hugo Award. Throughout the 1980s, Martin worked in television, writing for science fiction- and fantasy-themed shows like The Twilight Zone and Beauty and the Beast. At this time he became involved with Wild Cards, a long-running anthology series composed of "mosaic stories" written by multiple authors and set in a shared universe. In addition to editing the series, Martin has contributed stories to the Wild Card books. In 1996, Martin published A Game of Thrones, the first installment of his magnum opus, the epic fantasy series A Song of Fire and Ice. 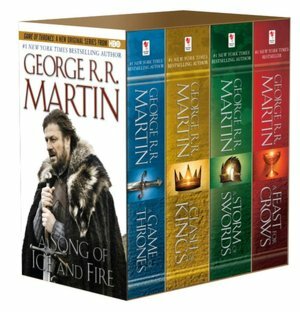 Set in the Seven Kingdoms, a realm resembling medieval Europe, the internationally bestselling series has provided the ultimate showcase for Martin's formidable world-building and characterization skills. During the course of his long, prolific career, Martin has accrued every major literary prize for science fiction or fantasy writing, including the Hugo, Nebula, World Fantasy, Bram Stoker, Daedelus, and Locus awards. But what endears him especially to his readers is his extraordinary accessibility. A tireless participant in genre conventions and festivals, he maintains a cordial relationship with his fans through his website and blog. He is also a member of the Science Fiction & Fantasy Writers of America.